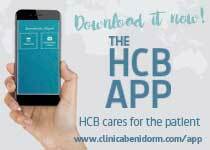 The Obesity Unit of Hospital Clínica Benidorm helps patients to reach their weight goals. 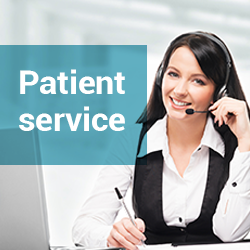 The unit offers a simple treatment plan where the patient is always informed and supported by the best professionals. The Obesity Unit of Hospital Clínica Benidorm has organized a full team of specialists of the surgical treatment of obesity to help obese patients to reach their weight goals and improve their health and quality of life. For this, doctor specialized in Internal Medicine will evaluate the patient’s health and guide it through the process. In the initial evaluation phase, as well as during the whole year of follow-up, the Internist may refer the patient to the related specialists depending on the case. 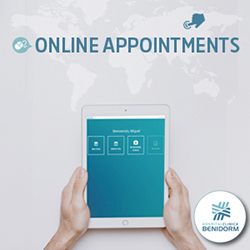 The Obesity unit of Hospital Clínica Benidorm offers, always within the same medical and hospital center, a simple medical and care plan where the patient is always informed and supported by the best professionals. Bariatric surgery is an operation that helps you lose weight by making changes to your digestive system. In these types of interventions a small video camera and surgical instruments are inserted through small incisions in the abdomen. These techniques allow a faster recovery with fewer complications. Some types of bariatric surgeries make the stomach smaller, allowing to eat and drink less at one time and making feel full sooner. Other bariatric surgeries also change the small intestine – the part of the body that absorbs calories and nutrients from foods and beverages. The inflatable band is placed around the upper part of the stomach to create a smaller stomach pouch. The pouch fills with food quickly, and the band slows the passage of food from the pouch to the lower part of the stomach. It is removable, requiring only a laparoscopic procedure to remove the band, after which the stomach usually returns to its normal pre-banded size so it is not unusual for a person to gain weight after having a band removed. The patient needs fewer vitamin supplements. The result depends on the patient’s will. 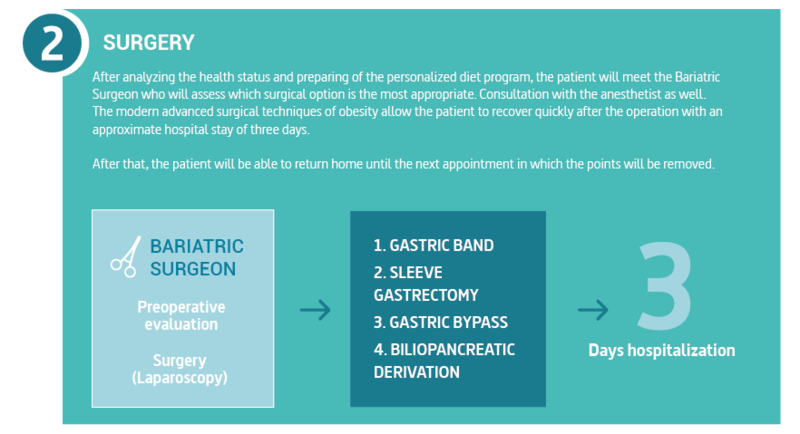 Sleeve gastrectomy is a surgical procedure in which the stomach is reduced to about 15% of its original size, by surgical removal of a large portion of the stomach along the greater curvature. The result is a sleeve or tube like structure. The procedure permanently reduces the size of the stomach, although there could be some dilatation of the stomach later on in life. The procedure is irreversible. The result will be a gradual and lasting weight loss. Cause an improvement in other diseases caused by obesity, such as type 2 diabetes. It consists of leaving a very small functional and deriving a part of the intestine to get a reduction in the amount of food that patient can eat and a slight reduction in the absorption of food. It is hardly reversible, complex to perform and has a risk of bleeding, fistula, stenosis, internal hernia and malnutrition. It is recognized as the standard technique. Need multivitamin supplements and life-long controls. It’s the intervention that achieves the greatest weight loss. In a biliopancreatic diversion part of the stomach is removed. The remaining part of the stomach is connected to the lower portion of the small intestine. It is only recommended for selected patients because of the high risk of malnutrition. Obesity is one of the most pervasive, chronic diseases in need of new strategies for medical treatment and prevention. Obesity is defined as excess adipose tissue. There are several different methods for determining excess adipose (fat) tissue; the most common being the Body Mass Index (BMI) (see below). A fat cell is an endocrine cell and adipose tissue is an endocrine organ. As such, adipose tissue secretes a number of products, including metabolites, cytokines, lipids, and coagulation factors among others. Significantly, excess adiposity or obesity causes increased levels of circulating fatty acids and inflammation. This can lead to insulin resistance, which in turn can lead to type 2 diabetes. Body Mass Index (BMI) is a mathematical calculation involving height and weight, irrespective of family history, gender, age or race. BMI is calculated by dividing a person’s body weight in kilograms by their height in meters squared (weight [kg] height [m]2). Adequate understanding of the changes produced by the intervention and a good adherence to the proposed therapeutic strategy. Changes in Quality of Life and Psychological Status after the Surgery. Improvement or cure of diabetes, hypertension, cholesterol, etc. Improve breathing problems, snoring, sleep apnea and heart failure. Reduce the problems of knee and hip osteoarthritis. In addition to improvements in health and longevity, surgical weight-loss improves overall quality of life. Measures of quality of life that are positively affected by bariatric surgery include physical functions such as mobility, self-esteem, work, social interactions, and sexual function.